If you’ve been following my one-day odyssey so far, you’ll know that I spent the whole of Friday 9th February 2018 at the cinema watching four movies back to back, and had made it halfway through before settling down to watching the third film of the day, Clint Eastwood’s retelling of the thwarted terrorist attack in 2015 aboard a train from Amsterdam to Paris, and the three American friends who stopped him. That first half of my day had its ups and downs – need I remind one of the onslaught of terror that was Status Update? – and I thought to myself that no matter how this next movie would turn out, at least it would be better than Fifty Shades Freed, which I was seeing right after. But life found a way to surprise me for a second time in 24 hours, because it turned out that a Fifty Shades movie felt more like a film than the new Clint Eastwood joint, which takes a real-life event of heroism and courage and turns it into something that barely functions as a three-act narrative that nobody can watch without being mortified that something this inept and amateur could be made by such a respected filmmaker, let alone released into cinemas nationwide. 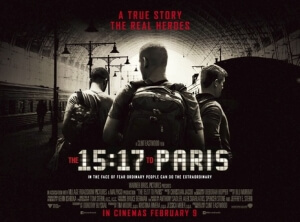 The 15:17 in Paris’s biggest selling point is that the three friends who stopped the Islamic terrorist on board the train that fateful day – Spencer Stone, Anthony Sadler and Alek Skarlatos – are played by themselves, in an extended recreation of the event itself and all of the events leading up to it. Unfortunately, that incident, aside from brief flash-forwards to it early on in the movie, is not covered until the last fifteen minutes, and a large portion of what precedes it is just these three guys going on a lads’ tour of Europe that is profoundly uninteresting and with absolutely zero cinematic qualities to it in the slightest. Before then, there’s a brief look at their friendship during their childhood, when they attended what is apparently the worst Christian school in America – seriously, the teachers constantly give these kids crap for the most mundane of things, whether it’s standing around in the hallway mere seconds after the bell has rung, being sent to the principal’s office for using mild language (after being hit by a basketball, which shows their priorities are on point! ), and the principal giving one of their mothers parental advice that their kid should go live with their father instead. In case you haven’t picked up on it yet, outside of the train incident there is absolutely no story worth telling around these three guys, and that’s one of the film’s biggest mistakes. This kind of story, especially one featuring these real-life heroes, would perhaps be best suited for a documentary, which could go a lot more into how they felt as they selflessly risked their lives to stop the terrorist from doing what he could have done, and maybe how it impacted their lives immediately afterwards. However, by adapting it into a traditional three-act structure, Eastwood unintentionally exposes how shallow everything leading up to it was, and how these three people led lives that had absolutely no dramatic weight to them whatsoever before they stepped onto that train on that fateful day. Because very little happens in terms of drama, and the acting really isn’t good at all (I mean, props to these three guys for everything they did in real life, but they are not professional actors and boy does that show in their performances), there is absolutely nothing to grab your interest until the last fifteen minutes that depict the attack itself, so it’s not only incredibly boring but also you’re more focused on the terrible acting and questionable filmmaking choices more than whatever is happening on screen, because that’s the only thing you can focus on. Knowing that a film legend like Clint Eastwood made this dead-zone of a movie is kind of like learning that Steven Spielberg directed The Emoji Movie; you can’t believe that someone who clearly knows how to make a movie work can deliver something so lifeless and unengaging, and in doing so undermines the extremely brave and noble thing that these three guys – not to mention British hero Chris Norman, who just like in real life is insultingly pushed to the side so that all of the focus can be on these young brash Americans instead – did on that day. It’s probably the worst movie that Eastwood has directed, because as not very good as some of his movies have been over the last few years, at least there was a reasonably solid plot behind them, as well as actors who you could tell he was comfortable directing because they were professionally trained. Instead, this is just a collection of holiday footage spliced together with a really misguided section focused on their youth that in and of itself is sometimes hard to stomach. The opening scene, for instance, sees two of their mothers, played by Judy Greer and Jenna Fischer in two examples of how the acting by the professionals is just as bad as the untrained actors, quarrel with a teacher about the suggestion that their sons may have ADHD, and it plays out in a way that’s sure to anger a lot of people for its ignorant and even dangerous anti-medication message; one of them straight up tells the teacher that she trusts the Lord over her statistics. It’s an awful scene, and it sets the tone for what turned out to be a pretty awful, shockingly incoherent movie by a filmmaker who really should know better. The 15:17 to Paris is a thoroughly inept and shockingly misguided attempt at honouring a real-life act of heroism, with director Clint Eastwood embarrassing himself with terrible acting and almost zero story to make any of it interesting, which not only makes for Eastwood’s worst film as a director to date, but even worse undermines what these men did in reality.